UCF is No. 9 in the AP Poll heading into the season’s final stretch. The Knights (7-0, 4-0 AAC) will play host to Temple on Thursday night, but before we get there, let’s check in on what went down around the AAC during the bye week. The AAC East now has just two teams that are unbeaten in conference play: UCF and Temple. The two will face off on Thursday night, with the winner taking control of its own destiny heading into the final three weeks of the regular season. With that said, Cincinnati and South Florida aren’t yet out of the division race. The Knights have to face all three within the next four weeks, which will be a major test. With losses from the Bearcats and Bulls in the last two weeks, UCF no longer has a ranked opponent on its schedule. It’s possible that one of the two makes its way back into the rankings before meeting the defending champions, but as of now, the Knights might not play a ranked team until a potential AAC Championship Game appearance. The AAC West belongs solely to Houston right now. The Cougars dominated South Florida to improve to 7-1 overall and 4-0 in conference play. They debuted in the AP Top 25 this week at No. 17, which puts them just eight spots behind the Knights. There is next to no competition left for Houston in the AAC West, with every other team in the division having two or more conference losses. Considering the proficiency of the Cougars’ offense, a potential matchup with the Knights in the conference title game would likely produce a lot of points. But with the level of competition in the AAC East, there’s no guarantee that UCF plays on Dec. 1. It’s far more of a certainty that Houston will be there to face UCF, Temple, Cincinnati or South Florida. 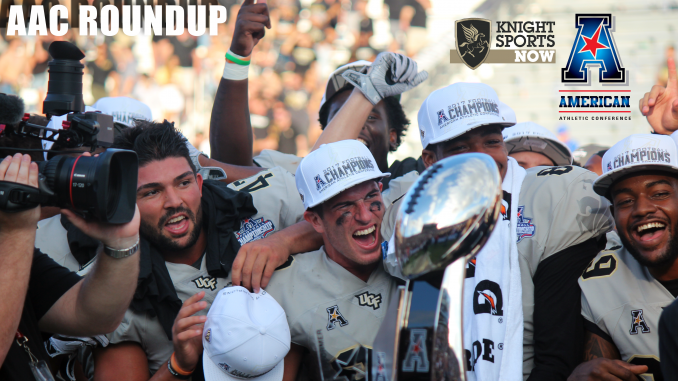 The Knights should still be the favorite in their division, but this week is the start of a tough road for them.